Jewish Facts From Portland: Who Was Moses and Why Do Jews Follow Him and Not Jesus or Mohammad? Who Was Moses and Why Do Jews Follow Him and Not Jesus or Mohammad? *Abraham, an Ibri (Hebrew, and meaning from the other side) whose family migrated from the other side (east ) of the Euphrates River was born in Ur, now in Iraq, and was the son of Terah, an Idol maker. One day Abraham told his father his views that idols were just what they made, statues made of clay and had no higher power. They were not gods. Terah's business was ruined with this revelation and they left town to live by themselves as there was too much pressure in Ur to go along with this belief. Behind all these ideas was G-d leading Abraham along and into a higher state of consciousness. They wound up in nearby Canaan, a land of pagan idolaters similar to Ur, for that was what most people were in the days in the 2nd millennium BCE. This means 2,000 years before Jesus was born. Abraham's son was Isaac, born to him by his wife, Sarah. Their grandson was Jacob. Jacob took his household of 70 people during a famine into Egypt. They stayed a little too long, and their numbers came to the attention of a population counter. They were afraid of their becoming a majority group, and so took them all as slaves to work on the Pharaoh's building projects of pyramids and storage cities. Anti-Semitism started right here. The Hebrews were too dangerous to keep and too important to lose. The Bible mentions that they were used as workers on these storage cities. A new Pharaoh decided to kill off the Hebrews. If a girl was born she would live, but the boys were to be killed. This would force the females to blend into Egypt's population. The pharaoh had a 2nd reason to decide on infanticide. His astrologer told him that the savior of the Jews was about to be born, so he ordered all boys to be killed for that reason. However, the midwives wouldn't do it. This went on until the Pharaoh came up with another ruling. All boys born of the Hebrews were to be thrown into the Nile River. Amram and Jochebed, his aunt, both from the tribe of Levi, were expecting a child and were wondering how they would keep it alive if it were a boy. After concealing him for 3 months, she had to do something drastic for the edict still was in effect. She put him in a wicker basket smearing with clay and pitch and put her boy into it and then put it in the river among the reeds growing along the bank. His older sister, Mirium watched for his safety at a distance so she could report back to her parents. The Pharaoh's daughter found the baby boy as she and her maidens were walking along the river. She took the baby and raised him as her own child, but she saw he was one of the Hebrew boys. She allowed a Hebrew wet nurse to come and allow him to suckle, and it was in reality his own mother, Jochebed. The princess named him "Moses", meaning "I drew him out of the water." He grew up in the household as a prince. The next scene is that of Moses as an adult witnessing for the first time an Egyptian taskmaster beating a Hebrew slave, and it made him so angry that he struck down the taskmaster for being so cruel. Evidently he accidentally killed him, so hid his body in the sand. The next day he witnessed two Hebrews fighting each other and tried to break them up, and they in turn let Moses know that they witnessed him killing the taskmaster. Now he was worried, as even then in Egypt you couldn't get away with that. He found out that the Pharaoh had been advised about his deed, and so he decided that he had to leave Egypt. He fled to Midian. 7 daughters of a religious Midianite man, a priest, found him by a well just at the time they were being threatened by some shepherds with their sheep who were trying to drive the girls away. Moses roused himself just in time to come to their defense. Moses wound up being given the eldest daughter, Zipporah for a wife. His 1st son was named Gershom. His 2nd was Eliezer. One day when he was with his father in law's sheep, he saw a bush on fire but not burning down. Out of it came G-d's voice directing him to return to Egypt and go to the present Pharaoh and ask for the release of his people. When asking who was sending him, the answer was, "I shall be as I shall be." So went Moses and after much pleading, was able to take the 600,000 out of Egypt. His older brother, Aaron, did the speaking for him as he had a speech impediment. Then he proceeded along the way that took him 40 years to write the rules of future living for this people. 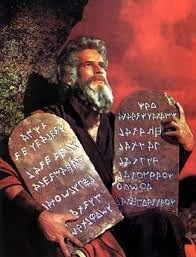 He wrote the 10 commandments first, but that was followed by much more which we call today, "The 5 books of Moses." One of the 12 tribes was Judah, and was the largest. It survived the downfall of the Northern Kingdom of Israel in 722 BCE when 10 of the 12 tribes were led into captivity. This is why we are called Jewish and our faith is called Judaism and our language is Hebrew and our land was renamed "Israel," for the first state which was ruled by King Saul. Many Jews own a 2 volume set of the 5 books called the Haftorahs. There's a lot of information there to learn and to study. Our main emphasis is about behavior being fair with others in all matters. We believe in life, "L' chaim!" We do not get concerned about what happens to us when we die. That's in G-ds hands anyway, but we do believe in an afterlife, in a world to come (Olam haba) where man is judged and where his soul continues to flourish. The belief is that all Israel has a share in the world to come" (Mishna Sanhaedrin 11:1). Our Jewish tradition cherishes life. The Torah was given to Israel so that "you shall live" by the teachings and not die through them. Death to us has no virtue since "The dead cannot praise the Lord...."
The first direction was to believe in one G-d only. We feel that we are all the sons and daughters of the one G-d, that we have this spark within us. That's why we do not worship Jesus or even Mohammad. To us they remain as men, which even the Muslims agree with us. It is the basis of our religion. The Jewish concept of G-d rejects any compromise with the spirituality of G-d. The notion of man becoming G-d or G-d assuming the form of man was repugnant to the Jewish religious spirit. They were to see this happening over and over in the Greek and Roman civilizations. The Jewish mind and faith cannot accept the notion of the infinite Divine reducing Himself to a finite mortal. We were not to make representations of G-d in an image, This was forbidden to us, which even Abraham realized before Moses's teachings. The 2nd Commandments that "You shall not make for yourself a sculptued image...you shall not bow down to them nor serve them" was understood as even for people who didn't really believe that the image was G-d but was only a symbol representing G-d. The sin of the Golden calf, when Aaron allowed the children of Israel to think that the calf was G-d when Moses had left the group to climb Mt. Sinai was not allowed just because they had demanded a visual image of G-d, Moses's unseen belief in a higher power. Moses was 80 years old when he started the 40 year trek, and died at age 120. Moses had handed the mantle of leadership over to Joshua. He died but outside of the Holy Land. His burial place is unknown so as not to start any worship of him. Moses is accepted as the author of the Pentateuch (5 Books of Moses) and the creator of Judaism, thereby the father of monotheism other than Abraham. Other writings such as the Midrash and late Aggadah tell of many legends about him. Other works were pseudepigraphically ascribed to him. It is not easy to become Jewish. We regard ourselves as being of one family, extended in most cases. However, it has been said that one can find a common ancestor if you go back 5 generations between a husband and a wife. Membership is through the mother, but not limited to just this way. A convert is looked upon as adopted into it and becomes a partner in faith and with the people of Israel, assuming burdens and tribulation along with sharing in its heritage and its privileges. They are assuming the spiritual mission of the future by tying themselves to our collective past. When the central sanctuary in Jerusalem was built, Jews saw it as a "House of Prayer for all peoples" (Isaiah 56: 7) (Kings I 8:41-43.) We come in all colors of skin. Our kinship is a mystical experience more than a rationally definable one. Jews are a conundrum. We are a faith, a religion as well as a nation. So we use the term people. We are a people. While many religions have fallen by the wayside along with their cultures and people, we come out of the past intact. In fact, ancient prophecies by the well known prophets are now coming true, especially with the creation of Israel and the ingathering of the Jewish people. We have maintained our beliefs but have kept up with the present, not to be thought of as "the old." I for one am so proud to have had such stubborn ancestors who stood by their beliefs in a religion so rightous, that we do not have the history of forcing anyone to believe as we do, but have tried to upgrade whatever we have found that we were living in; like our environment, social life, everyone's lives, not just our own. For Tikkun olam, repairing the world, is always on our minds, not destroying it.